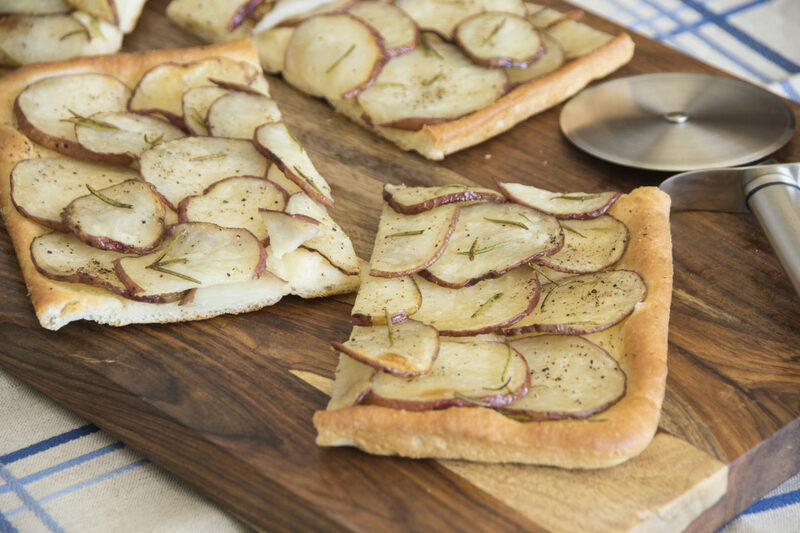 Try something new and out of the ordinary with our savory Red Potato Focaccia recipe. Spray counter lightly with non-stick cooking spray. Combine rolls together and roll into a 14-inch circle or 12×17-inch rectangle. Cover dough with plastic wrap and let rest. Mix potatoes, rosemary and 2 tablespoons olive oil in a microwave safe dish. Microwave for 3 minutes on high. Stir, rotate and cook for an additional 3 minutes. Remove wrap from dough and place on a sprayed 14-inch pizza pan or an 12×17-inch baking sheet. Cover with plastic wrap and let rise for 30 minutes. Remove wrap and press dough down with fingers to form a dimpled surface. Combine remaining 2 tablespoons olive oil with garlic salt and brush over dough. Spread potatoes evenly over dough. Sprinkle with salt and fresh ground pepper. Bake at 350°F 25-30 minutes.